Solutions development consultant with experience in large scale IT projects, especially in the telecommunications and financial services sectors. Nikos has worked in Microsoft for more than 6 years as an experienced services professional with broad technology knowledge of Microsoft application platform and business productivity services and products. He is a certified specialist in SharePoint Server Technologies. EDITORIAL NOTE: Blogging has surged in popularity in recent years. Companies and individuals are using blogging in order to express their voices and connect with their audience. Most of this is performed on the popular WordPress platform. Web Code Geeks recommend using WordPress as your publishing platform. We have been using it with great success for several years now. You may skip the introductory part and jump directly to the video below, where we guide you through how to setup your first WordPress blog, in less than 4 minutes! 1. Why be a blogger? I am quite sure that most of you have gone through that phase in your career when you feel that after many years of practice you have accomplished to rise above the basic level of writing short programs and manage to consistently develop unique software. You suddenly know that you can become known as the subject matter expert to a particular set of problems, but at the same time you do not seem to find a way to convince people about your proficiency and get them to have your work noticed. In other words you’ve reached an important milestone in your career where you should build your personal brand, but you cannot figure out how. Well you know what; blogging is the missing link that will give your business the required. Blogging opens up a wide range of opportunities for developers and it is a great tool through which you can share what you know, market your expertise and sell your products. Help your clients or future employers to know you better. Though for some people your LinkedIn profile may be enough, it cannot provide your prospect employers with the proper insight to the quality of your work and the level of your commitment. Drive a lot of publicity towards your side. Writing consistent and relevant content can really generate a lot of traffic without necessarily require from you to master SEO strategies. After a few months of blogging you will find yourself developing a mindset much better-rounded. One of the greatest differences between blogging and traditional publishing is the opportunity for readers to offer feedback. As the blog’s writer, you introduce a topic that you feel is significant and meaningful. You take time to lay out a subject in the minds of your readers and offer your thoughts on the topic. Then, the readers get to respond. And often at times, their responses in the comment section challenge you to take a new, fresh look at the very topic you thought was so important at first. Boost your level of confidence and make you a better developer and writer. My advisor at the university suggested that the best way to understand a subject is to write about it. Writing for a particular subject helps you dig deeper into it, increase your level of confidence and clear up any dark areas you may not even know existed. Serve as a personal digital record. Blogging trains you to be observant and gives weight to your personal growth. In that way it trains your mind to track life and articulate the changes you are experiencing. Your blog will become a personal journal of your life that is saved “in the cloud.” It can never be lost, stolen, or destroyed in a fire. Based on all of the previous points, our recommendation for keeping control of your content is to buy a domain on the Web and blog there. It will certainly require extra effort, but it’s totally worth it. Now, let’s try to address some of the most common questions. For many, thinking of WordPress is identical to thinking “blog.” WordPress is one of the world’s most powerful blogging platforms. According to W3Techs, WordPress is used by 58.6% of all the websites whose content management system we know. This is 24.9% of all websites. Now that is a huge number, a number that makes it almost impossible to find anything close to and as well-supported as WordPress. This means that if you deal with any kind of problem with WordPress, the chances of not getting a solution are almost zero. WordPress plugin architecture allows users to extend the features and functionality of a website or blog. WordPress has over 40,501 plugins available, each of which offers custom functions and features enabling you to tailor your blog to your specific needs and give it a unique look. With WordPress, you use a WordPress hosting provider to host your own site. You are free to decide how long you want to run it and when you want to shut it down. You own all your data, and you control what information you share with any third party. This is not the case with many of the other popular blogging platforms out there. That’s why we highly recommend using WordPress as your publishing platform, unless of course you have a specific reason to do otherwise. Free blogs appear less professional than paid ones. You have less control over the customization and look and feel of your blog. You have limited advertising and selling options. Unless you pay for your domain you’ll be obliged to get an additional domain name to your own, such as wordpress.com or blogspot.com. Thus your blog URL will look something like MyDomainName.wordpress.com. 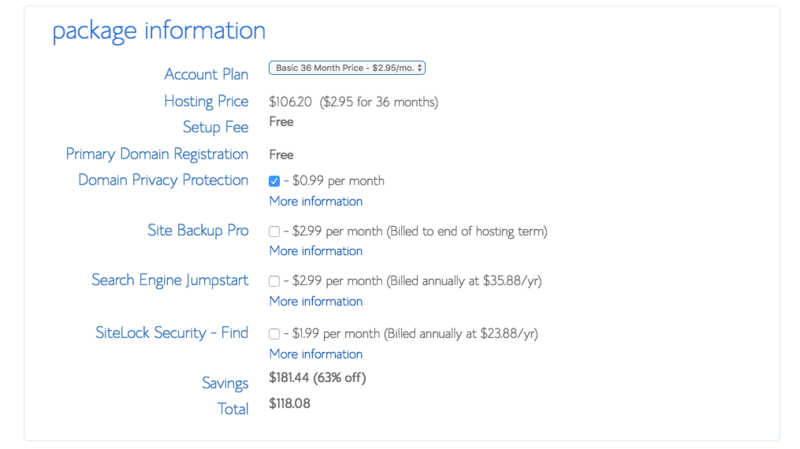 For all these reasons low-cost hosting is the choice I highly recommend for any blogger who is just starting up. It will not give you the most powerful server and the greatest amount of bandwidth, but if you’re just starting out with blogging, performance is not the first priority on your list. Shared hosting is the lowest tier available, but for many WordPress users (like startup bloggers for example), it is all that is needed. In this solution, a single server is partitioned for use by several clients who share the server’s resources as they are needed. This means that you have not a guaranteed allotment of system resources which makes this type of hosting the least reliable, but also the most affordable. There are a lot of companies in the market that offer shared WordPress hosting packages with a vast range of prices. Below you can find the lowest cost offerings of the most popular ones. Of course prices may change and naturally these are not the only companies providing shared WordPress hosting, but the list is provided as a guide for those of you who would like to dig deeper into this area. 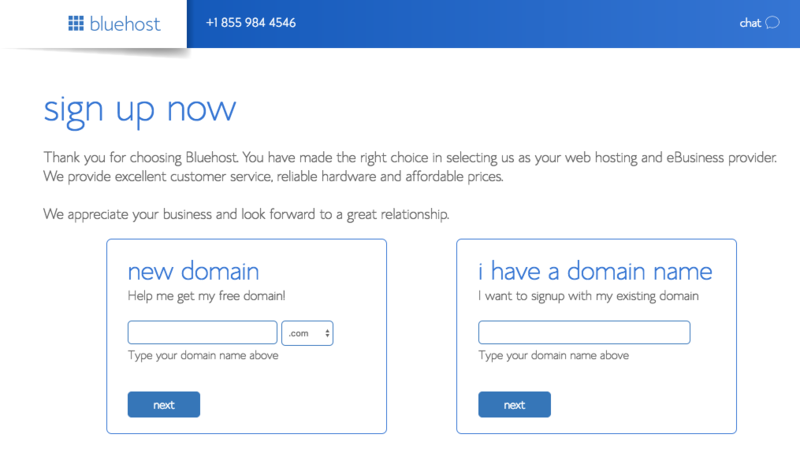 As we will explain later, Bluehost is our recommendation for shared WordPress hosting. Although shared hosting can do the trick for a lot of you, it is not the most reliable and care-free solution. Since resources are shared in a shared hosting scenario, it is not rare to find yourself dealing with issues regarding speed, security and up-time, losing the focus of what truly matters: selling your products and/or services to customers. This is where Managed Hosting comes along. In a nutshell, managed WordPress hosting deals with all of the back-end tasks related to running a WordPress site, so that you don’t have to. Beyond hosting, Managed WordPress Hosting also brings specific WordPress experience and work to optimize your site in many areas: speed, security, up-time, and updates to the WordPress core and plugin compatibility. Packages here include more expensive options, but they offer more features. Personal bloggers would probably be better off without managed hosting, but on the other hand, small businesses and big corporations should definitely consider it. The cost of managed hosting is totally justified if you compare it to that of hiring a system administrator to handle the various issues of a shared hosting environment. Also remember something that is really important: Managed hosting is geared specifically towards WordPress. If you want your site to be on the cutting edge, having a provider focused on your content management system can pay off. Security is key. With WordPress powering about 18% of the web these days, it is a big target for spammers and hackers. Managed hosting services take security very seriously. Is Managed WordPress Hosting a Good Investment? Whether or not to get managed WordPress hosting ultimately comes down to a logical analysis of costs and benefits – will the time you save and the features you gain end up saving more money than you spend on managed WordPress hosting? If the answer is yes, then it is hard to justify not making the switch. If the answer is no then low-cost shared hosting is the recommended approach. Most trusted web hosting, VPS hosting, cloud and dedicated server solutions for web designers, developers and creatives. Also known for providing responsive, 24/7 support for its shared hosting service Media Temple hosting service is built on a blazing-fast managed WordPress hosting platform, optimized to the exacting standards of WordPress pros combined with industry leading live support. A VPS is a private, virtual server that exists on a much more powerful physical machine and has its resources fully partitioned for two or more clients. But unlike shared hosting, you have a guaranteed allotment of system resources that only you have access to and no crossover occurs between clients. So, even if there is a much bigger website than yours on another VPS, hosted on the same physical machine, that won’t matter: you’re always guaranteed the system resources that you’re paying for. Think of it like one big computer, running lots of little computers inside of it. This means that in terms of performance and scalability, a VPS is a better solution than that of a shared hosting. Plus you do not have to worry about migration once your site grows bigger. VPS hosting is best for businesses, websites that experience heavy traffic and websites that require custom software installations. The main downfall of VPS is that due to the fact that it is not a solution specialized in WordPress, you have to perform all server management tasks on your own. In most cases a VPS comes with only its operating system installed and you are the person responsible for installing all the stuff needed for a WordPress to run smoothly. This includes the main installation of WordPress, along with all its necessary updates and plugins and all the relative software required for your WordPress site to run correctly (PHP, MySQL etc.). Plus, all architectural decisions regarding security, scaling and caching should be taken and implemented by you. The are no control panels, one-click installations or user friendly interfaces here. The command line is your only friend. So, if you are not absolute certain about your WordPress installation and administration skills, I would strongly advise you to choose any of the Managed Hosting solutions presented in this article that may cost you more, but will definitely save you from a lot of trouble. Now, if you decide to go down that road, there are a few options in the market, the best of which are Linode and Digital Ocean. Digital Ocean is the recommendedoption and probably the least expensive ($5/month whereas Linode starts at $10/month). They are very responsive and they have blazing fast SSDs for all their virtual machines. You have the required server management skills and you feel confident that you can handle the daily tasks of administering a server exposed to the Internet. The invention of cloud computing brought about a revolution in storage and velocity. Its three main characteristics – Availability, Scalability and Redundancy enabled it to become an extremely successful model for providing Infrastructure as a Service (IaaS) over the Internet. VPS is focused on the server/compute with hard disk local storage while clouds usually provide more services such as database, load balancing, networking, etc. The term unmanaged cloud hosting means that in any of the available products you’re provided with one or more servers in the cloud that usually has no additional software or configuration apart from its operating system. Like in the VPS scenario, the installation of WordPress as well as the work of any supplemental patching or configuration, has to be done on your own and that is something that requires a significant amount of server-management knowledge and technical expertise. With a basic, unmanaged hosting plan, you cannot run websites “out of the box” and there is no graphical interface for you to use to interact with the server. In short, unmanaged servers/hosting plans are definitely reserved for the tech savvy! On the other hand, in Managed WordPress Cloud Hosting, everything from the hardware to the software is highly tuned for running only WordPress sites. Patching, updating, configuration are automatically configured by the hosting service and thus no server management skills are required. The main disadvantage of this type of managed hosting is the loss of flexibility. Often you may be restricted to only running certain WordPress plugins or updates. Other than that Managed WordPress Cloud Hosting should be in your list of solutions especially if you require high performance and security and less personal involvement in the administration of your site. One of the leaders in the space of Managed Cloud Hosting is Cloudways. Cloudways (Cloudways Managed Cloud Hosting Giveaway) offers managed cloud hosting. This means that they configure your servers, they patch them, and they apply updates to your application software. You don’t have to lift a finger. All cloud servers on Cloudways get automatic firmware and OS patches so you don’t have to worry about the security of your server. And all servers & applications are tucked away behind secure firewalls to prevent unauthorized access or hacking attempts. So to summarize, you don’t have to worry about your cloud server at all. Cloudways has everything covered. They also offer One-click WordPress installation (in addition to many other website options). This means you can skip the tedious steps for manual WordPress installation, and spend more time focusing on your website content. 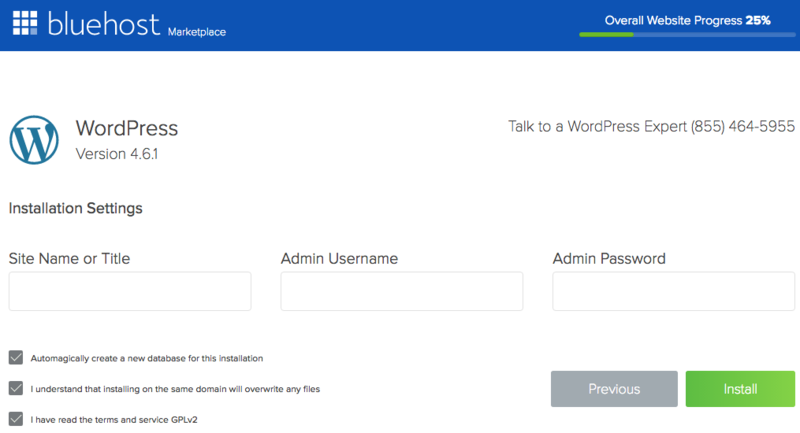 As we briefly mentioned before, Cloudways has automatic WordPress updates. When WordPress releases an update it will automatically be applied to your server. This way you don’t have to worry about your website if you take a long holiday, or are away from the office for a while – Cloudways has you covered. No gimmicks, no contracts. You can enjoy the comfort of a 30-day money back guarantee and the option to cancel at any time. 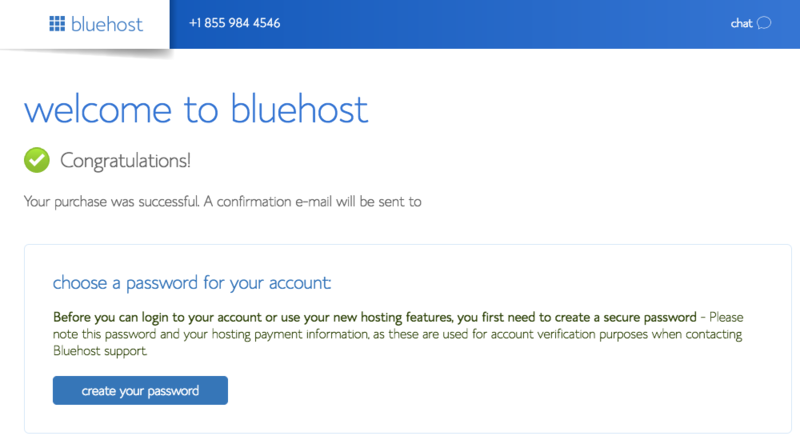 To set up your hosting account with Bluehost, follow the steps below or check out this video tutorial that will walk you through the necessary steps. Before you get started, it will speed up the process to think of a domain name you want to use and to have your credit card for payment ready to go. 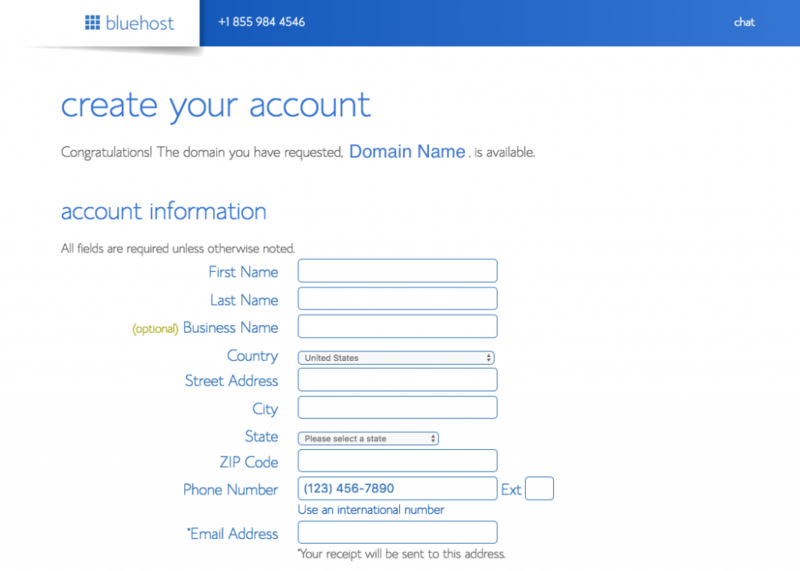 Go to Bluehost home page by either hitting the affiliated link here or use www.bluehost.com. Click Get started now. Fill in the form provided with your personal and billing information. 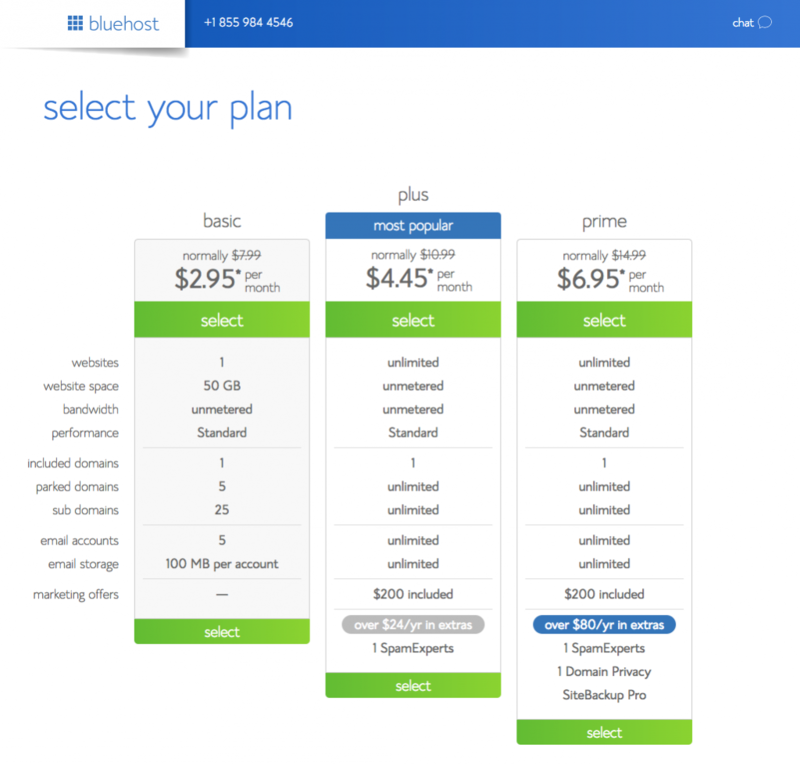 Select the account plan period. The longer term you purchase the lower the monthly rate is going to be. There are few other offers provided at sign up, which you can include at your discretion. We recommend to uncheck all of them at this time and add them later whenever you decide that you need them. 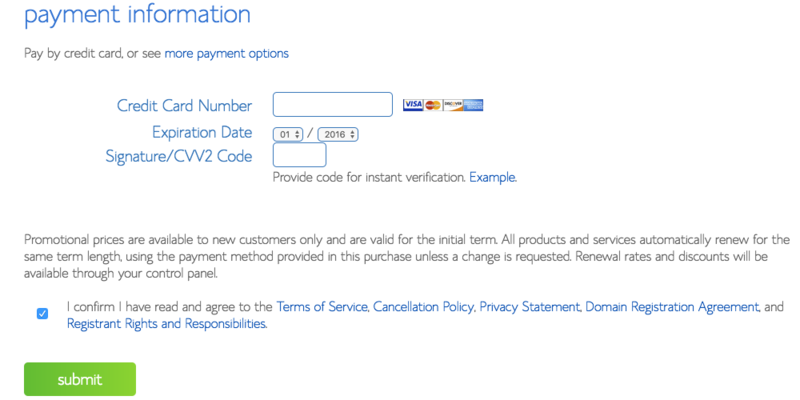 After you’ve filled in your package and payment information and chosen your hosting package, click the Submit button to complete your purchase. 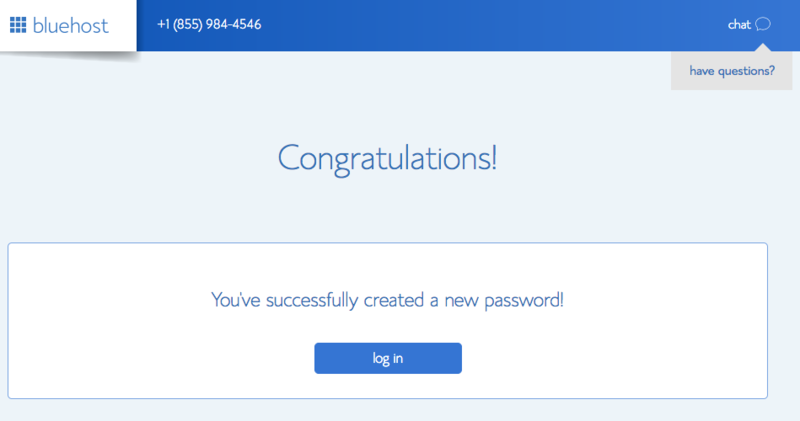 In the following screen, you’ll be informed that your purchase has been successful and will be asked to create a password for your account. 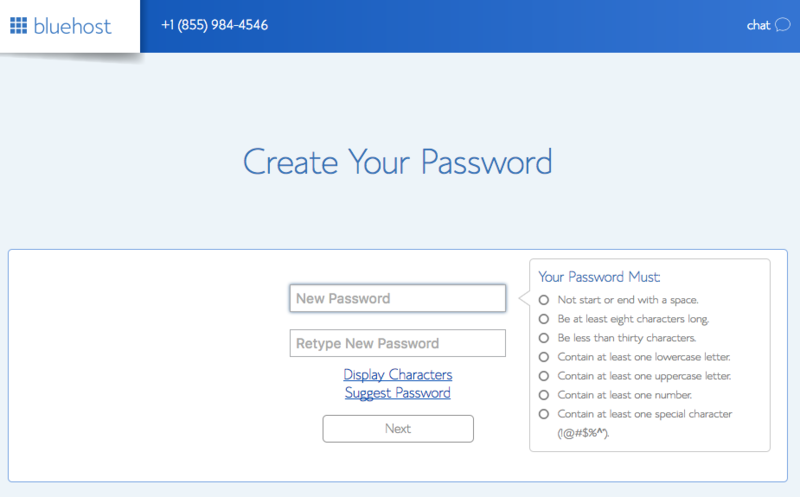 You can use the Password Generator to create a strong and secure password, or create one yourself. If you decide to do it yourself, it is required for your password to follow a certain policy to protect your account. Click on the Create button to complete the sign-up process. 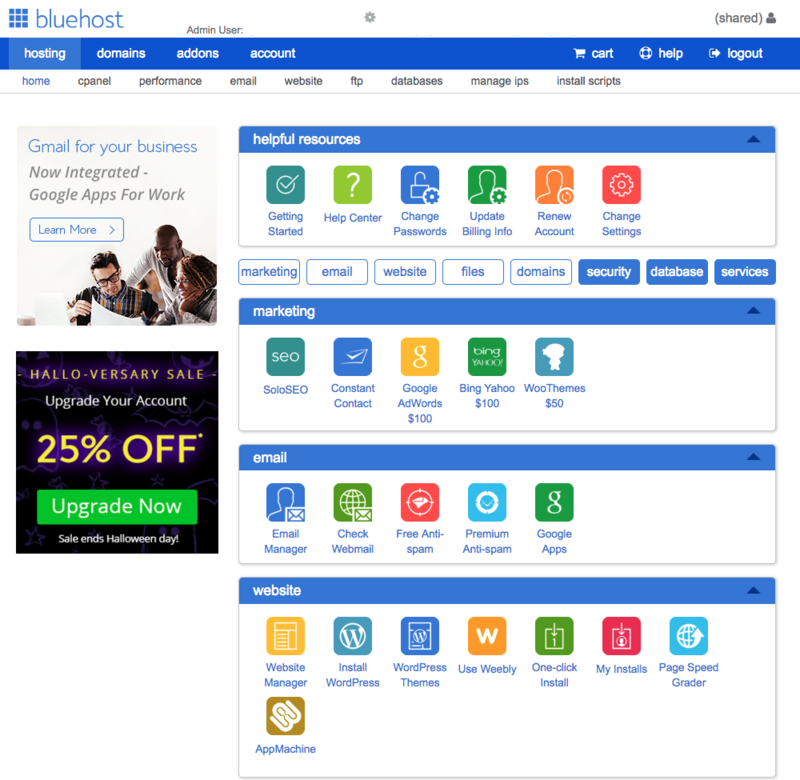 This may seem like the most complicated step, but as you’ll soon find out Bluehost has worked hard to make this one of the easiest things for you to do by using the new MOJO Marketplace for installing WordPress and other applications. 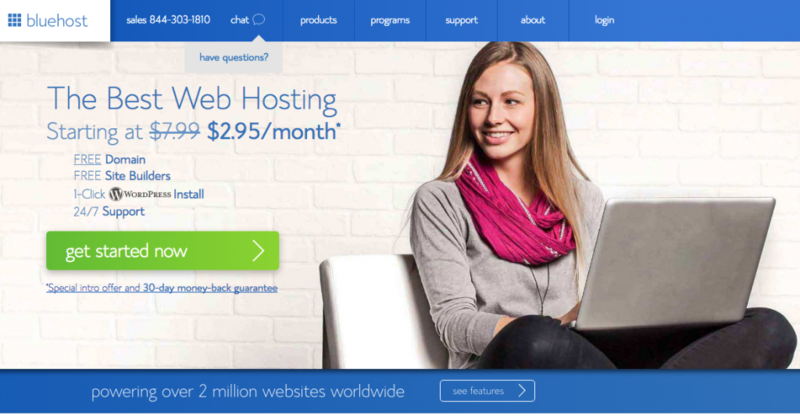 The following page is the starting point for the most popular options related to your hosting. It contains various links, from helpful resources, to marketing and e-mail configuration options, but also has a section named website where you can find a number of options for administering your site. 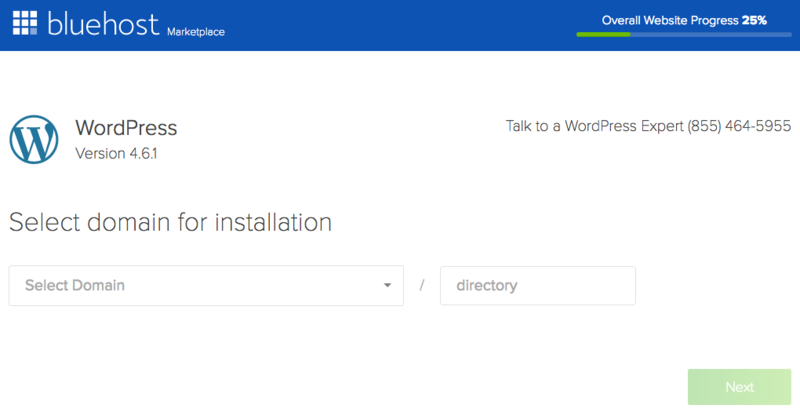 It is under this section where you can locate and click the Install WordPress link. The system will check for the availability of the supplied domain name and will lead you to the next page. Select a name for your site, the admin username and password. After you’ve read the terms and conditions, check the box indicating that you’ve done so, then click Install. Now you’ll see the green progress page, which will show you how far along the installation is. Once WordPress is fully installed, it will provide you with your site URL, the admin login URL, your username, and password. You will get a copy of this information, except your password, in your email as well. Make sure to keep it in a safe place. 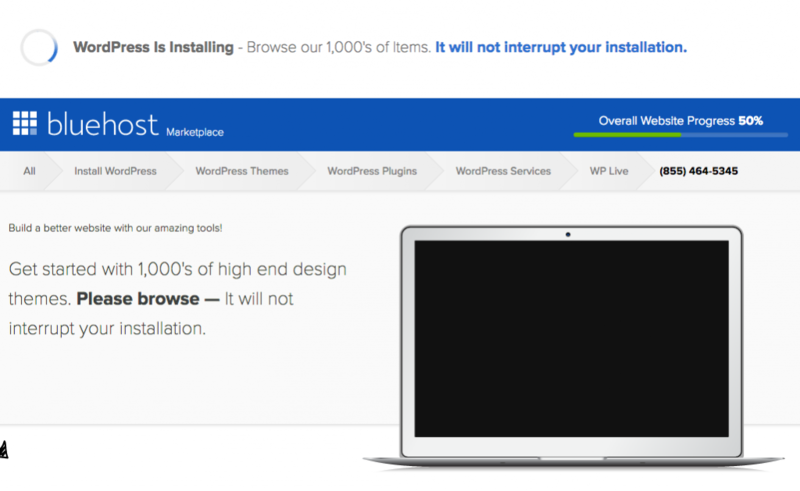 Once the “Your install is complete!” is displayed, you’re set to access your new WordPress blog. The screen contains all the information you need to log in to your blog. Pay extra attention to the Admin URL. Write it down because this is the URL that you’re going to use every time you’d like to perform any kind of action to your blog. 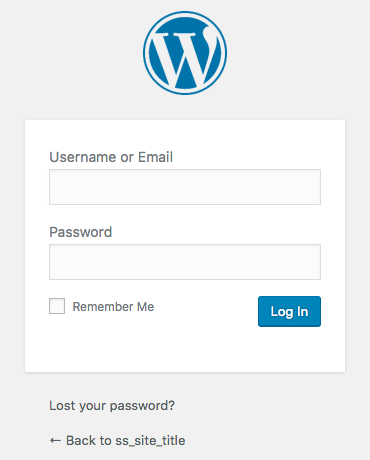 At this point you can log into your WordPress site by going to the admin login URL. Paste it to a new browser window, enter your username and password and click Log In. This will take you to your WordPress dashboard. From there, you can control everything that has to do with your WordPress blog, such as creating pages, writing posts, and changing the appearance. Hit the Posts link from the left navigation menu of your dashboard. This will list all of your existing posts. Next click on the Add New blue button to create a new post. Provide a title and some content for your post and hit either the Preview button to view your post before going public or the Publish button to have your content immediately exposed to the Internet . Le voila! Your first post of your brand new blog is a reality. Final note: You’ll notice there are affiliate links throughout this post. This means that if you sign up for one of these services, webcodegeeks do earn a commission. Selecting these links is not in any case obligatory, but just a way of showing your appreciation in case that you found the current material helpful. Apart from that every recommendation made in this post is solely driven by professional experience and is aimed at facilitating your efforts to improve your career. 12 Comments Views Tweet it! Dear i never seen these kind of blog post before on any blog. Actually this super Guide to start WordPress blog to a newbie because in this post you have explained everything an newbie can understand easily and start blog with these simple steps. Actually as per your recommendation which hosting will be good with No downtime and great performance ? This is my first visit on your blog and found this article pretty helpful. I started my blog career with blogger platform but immediately shifted to WordPress .I am pretty happy now on this platform and the points you have discussed on ho to start a blog is pretty helpful for newbies for sure. It looks like a complete post for newbie who want to install a new wordpress blog. Well, it’s complete info about how to install a wordpress blog, Looking forword to next version about plugins and extensions. Currently I own a blog in Google blogger and plan to move to wordpress. Your article is a great help for me. There is no alternative for newbies coz here we found more than we need, this post is rock, I like it and appreciated. Yes, the article is good useful information who want to make their website with wordpress. Very thanks for sharing the article. Thanks for this exceptionally comprehensive article and for giving us such great tips! 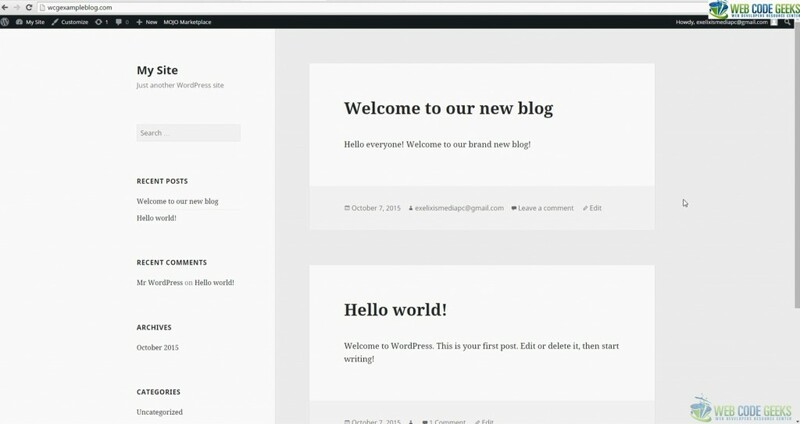 Starting a WordPress blog is a great initiative, which more and more people opt for. But, such projects need a reliable hosting provider, which can keep them up and running. I chose one of BGOcloud’s web hosting plans and thanks to it my website’s performance has significantly improved. The plan, which I’m currently using, includes SSD storage and CloudFlare CDN, and thanks to my blog’s loading speed is a lot faster now.